“This spring, the Southeastern Center for Contemporary Art will present the first solo museum exhibition of Devin Leonardi’s indelible art. As many of you know, we were robbed of this talented, young artist’s light and life last summer. 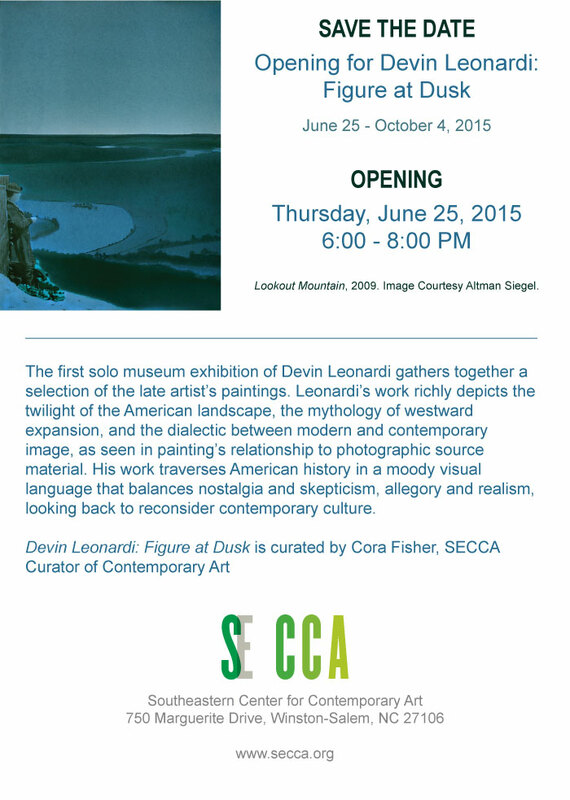 The exhibition, Devin Leonardi: Figure at Dusk, was already underway. As you can imagine, the scope and nature of the show changed considerably, from a showing of recent works to a more extensive retrospective. As a public institution with a modest budget, this has created some need in terms of realizing this exhibition to be as comprehensive as possible and, hopefully, to fund a hardcover publication. For those who wish to support this exhibition’s production costs and the photography of his work for a future publication, we have created a Devin Leonardi Memorial Exhibition Fund. If you can or would like to contribute even a small amount towards the production costs, you can go to this link to donate. We thank those lenders who have already shown their support by sharing their work with our public. This exhibition would not be possible without you. We believe that it will help keep visible this work and to celebrate the positive spirit of Devin’s life. PS – When we were kids, Devin and I used to hang out at Barnes and Noble. He’d grab stacks of art books and peruse them for hours over Italian Cream Sodas (flavored syrup with seltzer and water, i.e. the childhood equivalent of opulent coffee drinks). After much deliberation, he finally splurged on a $40 hardcover…a big deal when you’re twelve! Considering it’s his birthday, wouldn’t a contribution toward Devin’s catalog would make an excellent present?